The wordsmiths in our trade will tell you not to describe anything as “very big.” If it’s big, that’s all you need to say — big. They pound into you the word “very” adds nothing. Well, excuse me please, but trust me on this one: The newspaper that just landed on my desk is “very” big. In fact, I’ll go as far as saying it’s “very, very” big. 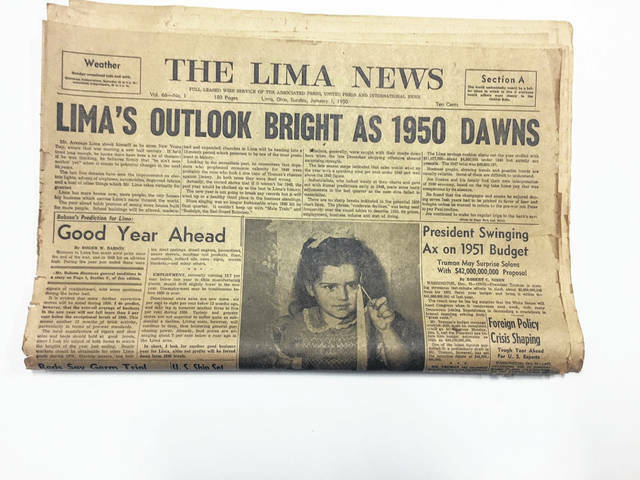 It’s the the Jan. 1, 1950, edition of The Lima News. It was brought in by Bill Dickerson, husband of Lila Dickerson, a former longtime employee of The Lima News. You need long arms and lots of time to wrestle with this monster. It is 17 inches wide and 24 inches long (today’s newspaper is 11½ by 21 inches) and there are 180 pages in Sections A to N (that’s 11 sections, if you’re counting). The front page includes 19 stories, but just one photograph: a cute picture of 3-year-old Cheryl Lauck, of 2224 Spencerville Road. Oh yeah, the paper cost a dime. A small story on the front page touts it as the biggest paper ever published in Allen County, surpassing the 124-page paper on Jan. 1, 1942. It was put out by 167 employees and 118 newspaper carriers. It required 54 tons of newsprint, which if stretched out, would be more than 350 miles long. Four barrels of ink were used, each weighing 480 pounds. An individual copy of the newspaper weighed 2 pounds, 13 ounces. The biggest newspaper since then was the Jan. 1, 2000, edition of The Lima News, nicknamed the “Y2K paper.” It consisted of 106 pages in seven sections. The 1950 newspaper celebrated news events from the previous year as well as those from the previous half-century. It also speculated on what was ahead. • The Lima Telephone and Telegraph Company said Lima’s 61,548 residents averaged 2,601 long-distance calls per day in 1949. • Records set: Allen County had its biggest year of tax collections in 1949, bringing in a combined $3.01 million in real estate, personal and classified taxes. 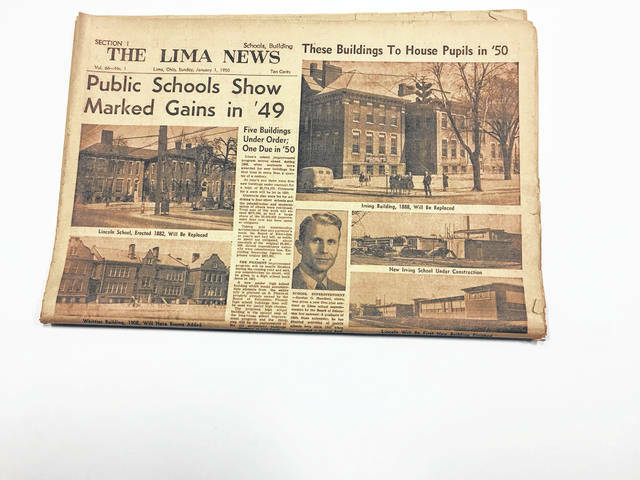 The Lima post office also set records. It handled 20.7 million pieces of mail in 1949, setting a record of gross receipts of more than $600,000. • Several advertisements heralded business longevity in Allen County. The Lima Sohio Refinery marked 63 years; L.S. Gardner Merchandising said it’s been selling school supplies, food containers, medicine and candy for 43 years; and Armstrong & Son Furniture marked 35 years. • People shared their New Year’s resolutions. Ruth Gunther, of Lima, said she was going to make the “supreme sacrifice” — she was going to “quit liking boys.” Robert Robenalt vowed to win the soap box derby. • After performing in his 43rd New Year’s Eve dance orchestra in Chicago, top-hatted Ted Lewis of Circleville, Ohio, told United Press International that, “people don’t get as drunk as they used to.” Night clubs were still a huge hit in Lima, however. Martin’s Tavern on Findlay Road advertised dancing and three shows every night of the week, 365 days in the year. • More than 500 area residents joined the military in 1949. • The Ada Bulldogs were saluted for being one of 1949’s top high school football teams with an 8-1 record. Their coach was Lee Tressel, father of former Ohio State football coach Jim Tressel. • Lima industry had a strong base that included places like Westinghouse, Artkraft Manufacturing, Hamilton Standard Controls and Davidson Enamel Products. However, the manufacturing sector was coming off a year that included employment cutbacks and the slashing of inventories. Its hope for jobs came from North Star Woolen Mills, which planned to move its headquarters to Lima from Minneapolis, and Westinghouse, which closed 1949 with its highest employment level of the year. Meanwhile, new schools were being built in Lima and City Council was to welcome two new members. Some city leaders were predicting Lima to have a population of 100,000 by the year 2000. It was a time of nervousness and cautious optimism. Change would come the next half century in ways never imagined. 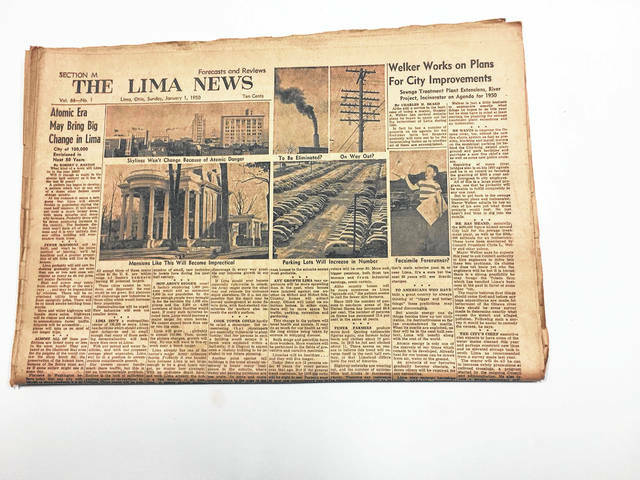 That 180-page edition of The Lima News is a history book of its era. In that regard, it’s similar to today’s newspapers and Web editions. All are recording history as it happens. Next week, we’ll share more from the largest newspaper in Allen County history. ROSES AND THORNS: The level of “smarts” just increased in the rose garden. Rose: To Ottoville, Miller City and New Bremen schools. Their students scored an “A” on the 2017-18 Ohio school report cards. 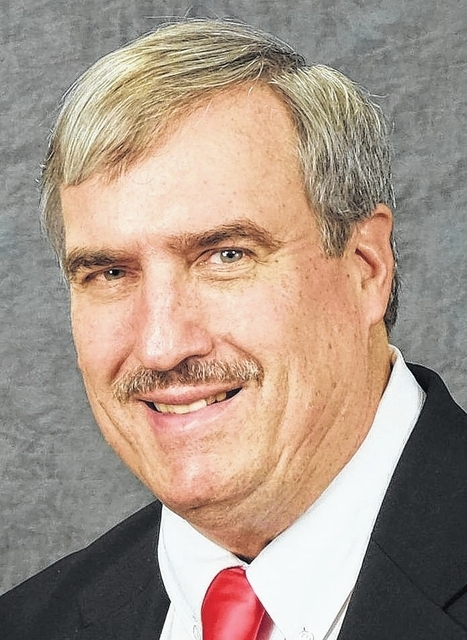 Rose: Derek Stemen, executive director of the West Central Ohio chapter of the American Red Cross in Lima, on Friday said 50 volunteers from west-central Ohio have been deployed to support Red Cross disaster workers already on the ground along the East Coast. Rose: To the people and donors who made possible the new $5.2 million Perry Webb Student Life Building at The Ohio State University-Lima campus. It offers students and faculty a fitness center, grab-and-go food services, an information commons and multipurpose lounging and work spaces. Thorn: Neighborhood issues reported by Lima City Council include issues with rats and landlords refusing to do routine maintenance. PARTING SHOT: Arguing increases resistance, because it is about winning. A dialogue decreases resistance, because it is about understanding.